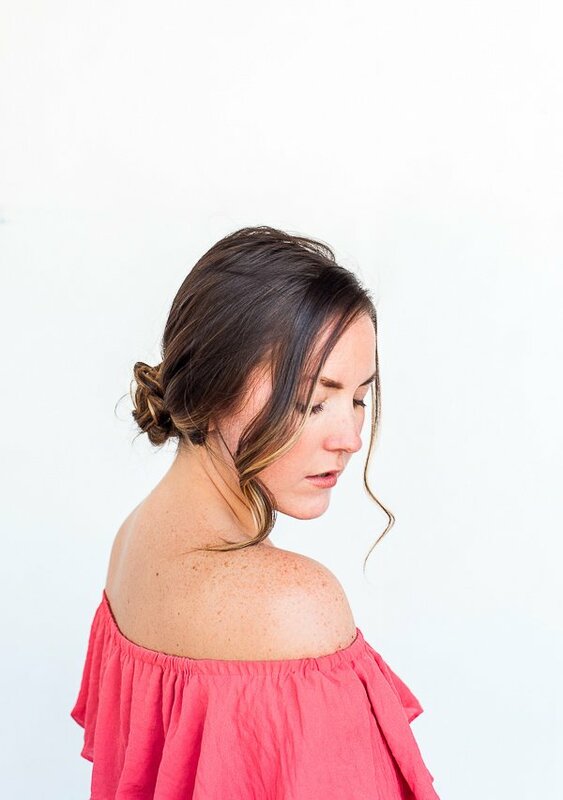 If you’re looking for an insanely easy updo hair hack for Valentine’s Day (or any other day you want to look a little fancy), this hair tutorial is for you! It takes 10 minutes to recreate (if that), but it looks way more complicated than it really is. Pinkie promise, even a beginner can tackle this one! 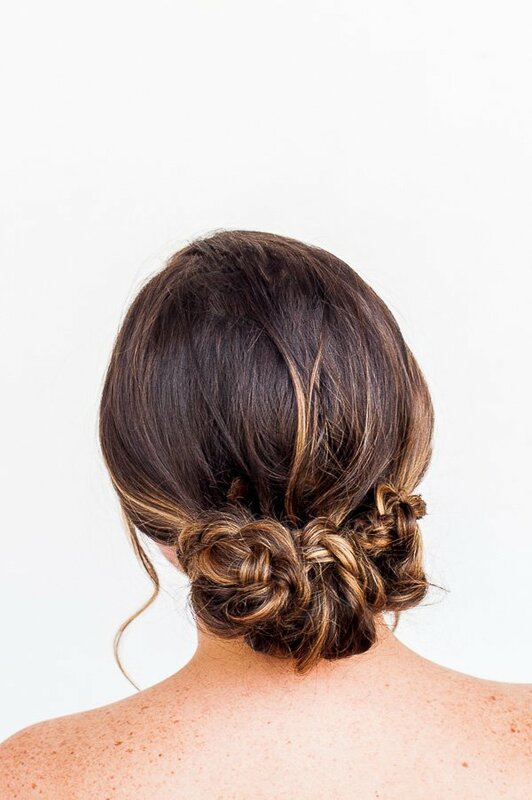 Click through to see how to hack your way to this easy updo in 10 minutes or less..
1. 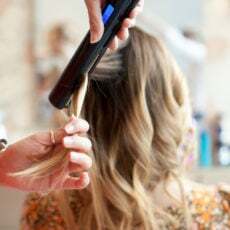 Start with curly or texturized hair (you can either curl your hair with a curling iron, let it air dry into soft waves, or use a texturizing product with clean hair), and section into three parts. 2. Pull each section into a low ponytail and wrap with an elastic hair tie. I like the tiny clear rubber bands for this tutorial because they won’t add extra bulk. 3. Next, braid each ponytail as normal and add another elastic to the end of each braid. Once braided, use your fingers to loosen the braid / make it more messy, by pulling on the braid in different areas. You can also backcomb sections of each braid if it isn’t looking very full. 4. Next, start twisting the braids up and over the initial elastics you added in step 2 to create the ponytails. And start pinning with bobby pins to hold in place. 5. Do that with all three braids, then pull any areas that still need to be filled in and add more bobby pins if needed. Spray with a strong hold hair spray if desired. And you’re good to go. 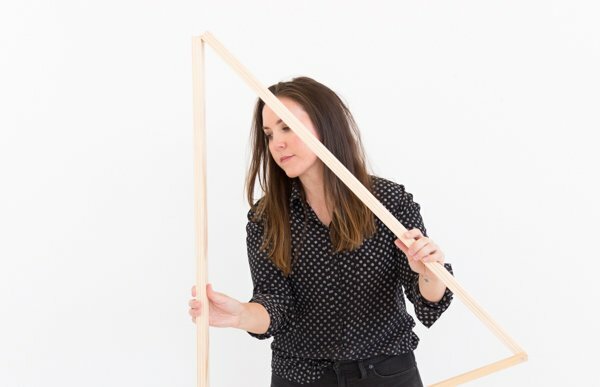 Side note… I realized when I was putting this post together that I totally look naked in all of the process shots. As progressive as I like to think I am, I’m not quite cool enough for a naked photo shoot. 🙂 Going to have to make note of that next time I wear an off the shoulder shirt. Haha. 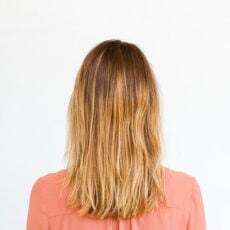 Think you’ll give this hair hack a try? What are your plans for Valentine’s Day? Anything special? I love this hairstyle, so gorgeous! 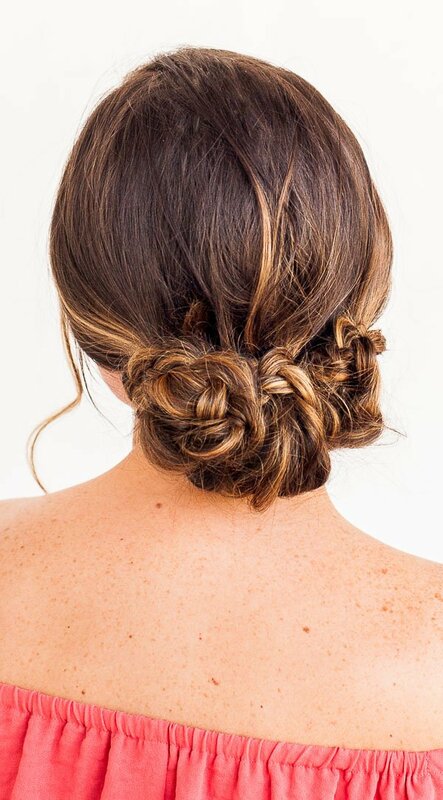 Aw, this is a beautiful updo! I wish I had longer hair so I could try this! Awesome Sonali. Happy to hear that! Thanks Sophie! Rachel did an awesome job as always with the hair design. I just got to sit there and get my hair done. Haha.